Archive of webcast notes for 2010 through April 2011. Click here for July 2011 Nature Biotechnology piece penned by ISIS CEO Stan Crooke. Click here to download September 2011 UBS conference slide deck. Click here to download January 2012 Research and Development Day slide deck (highly recommend). 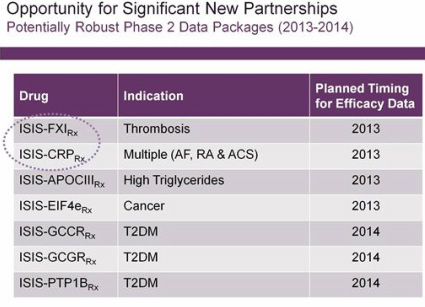 Each drug: "Why does target represent an attractive approach to treat patients with the diseases we are thinking about? Why do we think the target is particularly attractive for Antisense? 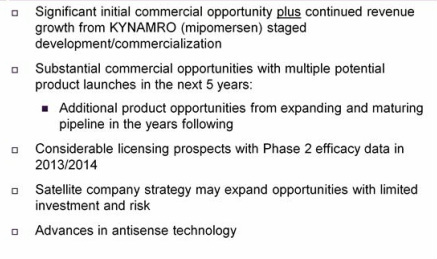 What do we think the commercial potential of the drug is? What do we need to see as the drug moves forward in development to believe that we have a winner? 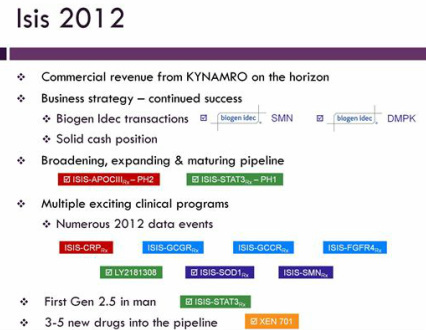 And finally, how does each drug fit into our portfolio in a fashion that contributes to the overall value of Isis? 11/2010: Gen 2.5: 10x potency vs Gen 2.0, allows oral dosing-first for cancer and rare diseases, IND of a gen 2.5 candidate perhaps 18 months. See below for description of candidates and their status below, grouped by disease area, and followed by projects being run by "satellite" companies which license ISIS technology. 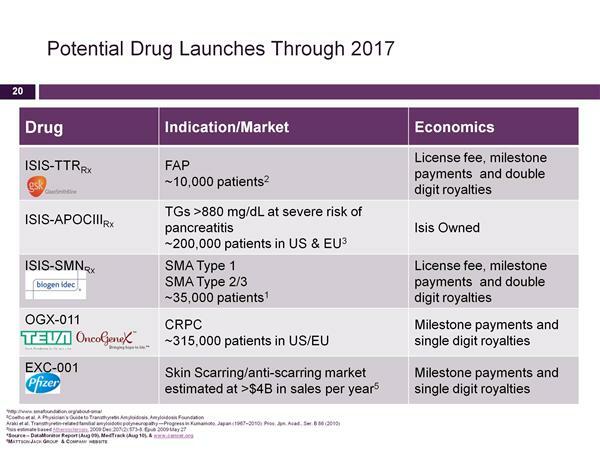 Isis does not pay for these drugs, but receives milestones/royalties and in some cases equity stakes in the company and manufacturing income.